Lord Jesus, who has willed to call me to the Ranks of the Equestrian Order of the Holy Sepulchre of Jerusalem, I humbly ask You, by the intercession of the most Blessed Virgin Mary, of Saint Joseph, Saint Peter, Saint Paul and all the Saints, to help me to remain faithful to the traditions of our Order, in practicing and defending the Catholic, Apostolic and Roman Religion against impiety and in exercising charity to my Neighbor and above all to the poor and sick in the Holy Land. Grant to me and my confreres the grace to support by prayer and sacrifice the maintenance of the Holy Places and the work of His Beatitude the Latin Patriarch of Jerusalem. 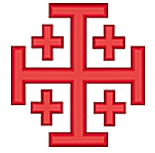 Give me the strength to be able to execute these desires with a truly Christian spirit, for The Glory of God, the peace of the world, and the good of the Equestrian Order of the Holy Sepulchre of Jerusalem. Amen.